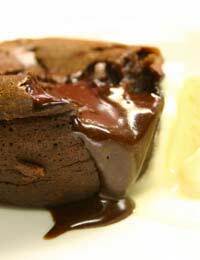 Nothing finishes a dinner party better than a superb dessert and a hot chocolate pudding is always popular. This individual dessert looks elegant and tastes delicious. The recipe serves four. Preheat the oven to 150C or Gas 2 and grease eight individual pudding moulds or medium sized ramekins with butter. In a large bowl sift the dry ingredients together and make a well in the middle. Pour the egg in to the well with the syrup, milk and oil, beat with a wooden spoon, slowly drawing in the dry ingredients from the sides of the bowl. Pour into the moulds or ramekins and bake in the middle of the preheated oven for around thirty minutes or until the top of the puddings is springy to the touch. When the puddings have about ten minutes still to cook, melt chocolate and cream together in a double boiler over a medium heat so that the chocolate does not granulate and then beat in spoonfuls of the icing sugar until the sauce is glossy and smooth. Unmould the puddings onto plates (you may find a hot butter knife or spatula helps with this) and spoon the chocolate sauce around the pudding. Dot the raspberries around the edge of the plate or make a heart shape on top of the pudding with them, whichever seems more appropriate for your guests! Lightly butter four ramekins or ovenproof cups – this recipe looks particularly pretty if you make it in unmatched but elegant teacups. Melt the chocolate in a double boiler or simply let it melt in a basin suspended over simmering water – don’t stir it though. Separate the eggs and beat the yolks with the sugar, until thick and creamy. In a separate bowl or a food processor, whisk egg whites till almost stiff. Now simply lower the butter into the melted chocolate and leave to melt before stirring in the chocolate hazelnut spread. Fold this blend into the egg yolk/sugar mix and then very gently fold in the egg whites using a metal spoon and taking care not to over-mix. Divide between the buttered dishes and place on a baking sheet in the centre of the oven for between 17 and 25 minutes till risen and the tops are cracked – the centres will still be slightly molten. Serve warm. If you have cooked them in teacups, put the saucers underneath and place a wafer biscuit on each one.